..Seeing rain for first time.. It was on day 28th of my birth, I saw rain for first time ever in my life. I just didn't know what is a rain. But I could smell the fresh water fallen on the dried soil. It was beautiful. My mom opened the windows and took me near. The climate was very nice for few days as it was raining for more than a week. Hello! I saw rain today - on my 28th Day on planet earth! As I mentioned earlier, I was taken to my maternal house for hair removal from NICU. It was a big function, where relatives from my dad's and mom's side were present. As per Islamic teachings, it is Sunnah(deeds or words of Prophet Mohammad which are good if we do, not a sin if we don't) to perform hair removal on 7th day. It can be done on any other day, but 7th day is highly preferred. Baby's parents name the baby and perform Aqeeqa on the same day.Aqeeqa means sacrificing a cattle in thanks to God and distributing it among the poor in the area, including them in our happiness. My dad performed Aqueeqa, and he says it was first time he put knife on a live buffalo..:) Aqueeqa was performed early in the morning, by 7.00 am. I was in NICU that time. My parents got me to home by 11 am. The barber lady who used to shave hair of all children in our family was already present. My paternal grandma held me on her lap and the lady removed my hair. I didn't cry or try to move. I was listening to what's happening on my head. Most of the relatives were seeing me for first time. As usual I was busy in sleeping. They gifted me with dress, gold, other baby items etc. My parents selected my first name SWABA, which means Breeze. It was after a month they finalized my second name that is Liyan which means Soft. The name has an Arabic origin. By 3.00 Pm I was taken back to hospital. I was given my first vaccination on the day - Hepatitis, Hib, DTP and BCG. It was on 6th day of my birth, my mom took me to Doc for a routine checkup. As soon as the doc looked at me, he seemed afraid and suspected that I was having physiological jaundice in a serious level. He requested an emergency blood test to check my bilirubin and found that my jaundice level was 'border level high'. He immediately took me to NICU. My mom was worried and nobody was there to console her, as she took me along with mid wife just for a checkup,and hasn't ever thought that I would be admitted there. She was all silent for a minute, just didn't know what to do next. Yeah, but she soon managed to inform my dad and grand parents. When my mom went to take my NICU admission, the receptionist asked her "whether baby's mom wants a room, looks like she had a c-section and where is she?". My mom smiled and said "I'm her mom," and the receptionist was really surprised- I heard my mom saying these to granny. 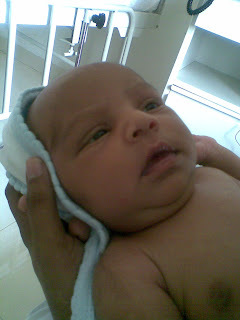 In the NICU I was alone, with a beautiful nurse aunty to look after me. I loved her except that I could not bear the pricks she made to take my blood sample for testing. My mom still counts the scars of those pricks on my both legs, hands etc. My mom stayed whole night sleepless as I was hungry every hour. She had to come to NICU every hour to feed me. The very next day was my 'hair removal' day. I 'll talk you about that later. For hair shaving, I was taken for few hours to home then got back to ICU. I peacefully slept under the 'phototherapy light'. Just got up for feeds frequently and slept again. My mom says, that aunty tried to give me formula feed as I cried terribly with hunger and could not wait for my mom to come. I vomited the entire milk right after my mom's arrival. On eight day I was discharged. I still had yellow color all over my body but my doc said my condition is normal. 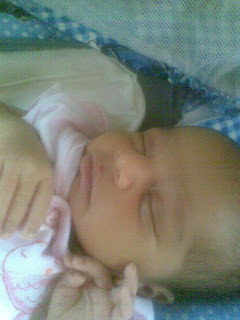 It was on 3rd day of birth, we were discharged and went to my maternal house. That is the first time I was traveling in a car, and I was seeing the 'world'. As usual I just didn't care about the sceneries, and I was all asleep. My auntis, uncle and grand parent were around me all the time. They carried me, kissed me, and talked to me.. The very next day I had a nice bath. Midwife -who takes care of me and my mom massaged me with coconut oil and bathed me in lukewarm water. It was a nice experience. I slept peacefully after that, just didn't care about things happening around me. I was really hungry right after my birth. The doc was busy in taking my apgar report, and sisters were cleaning me up. I thought, I should not cry as I wanted to be "bold and strong". I had no way to show my hunger, just can't speak, my mom was in operation theatre. So I put my fingers in my mouth and started licking my finger. My grand parents says my fingers were in my mouth, and I had opened my eyes looking all around (as if I am seeing the world) when I was handed over to them. My paternal grandma received me from the doc. Then my dad recited Azaan in my ears. My paternal granny gave a drop of Zam Zam water on my lips. Doc had weighed me and I was 3.180Kg and 51 cm taller when I was born. I got my first feeding once my mom's surgery got over. Then, I slept through the day. I just didn't care about the people who came to see the 'little me'. I opened my eyes and licked my fingers whenever I felt hungry and continued my sleep after each feeding. My first ever photograph taken few minutes after my birth. I am S____ Liya_ means Soft Breeze, and my parents call me Liya. 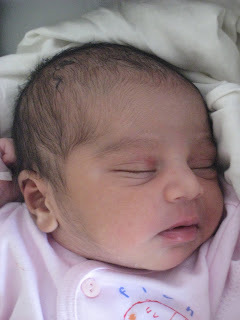 Born as grand daughter of Mr Abdul A__z and Mrs.Jam__a and Mr.M__a and Mrs.Zu__a, and daughter of Jaz__ and Nish__, on Sunday 11th Oct 2009, at 12.37AM, at MIMS hospital Kottakkal, Kerala. My birth weight was 3.180Kg and length was 51cms. I am the first grand child in my mom's family and a child born after 15 years in the house. I am the first grand child in Narikuth family - that's my dad's- as well-child born after 23 years. So as you guess I am the most loved, most cared one.. Through this blog, I would like to share all the interesting things about me as I grow up. I hope you will enjoy it. Read here, my mom writing about her eventful year passed by expecting me.